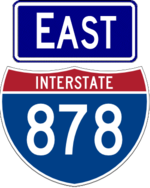 Interstate 878 is an eastbound-only, unsigned interstate. It is also the shortest interstate and NYSDOT doesn't acknowledge its existance. 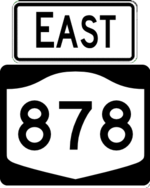 I-878 is a part of NY 878, one segment of which is the Nassau Expressway. The eastern segment is disconnected but the roadway is continuous via Rockaway Boulevard. The Nassau Expressway was originally known as I-78, with I-878 on the Bruckner Expressway; after the cancellation of the Lower Manhattan Expressway, the Nassau Expressway and the Cross Brooklyn Expressway were designated I-878. 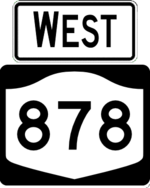 After the cancellation of the Cross Brooklyn Expressway, I-878 was resigned NY 878.